The GoodLand Bee Supply HE2MOT Motorized Honey Extractor is sturdy, efficient, though a bit more on the expensive side. Goodland Bee Supply is a reputable manufacturer of beekeeping supplies. The company has an impressive array of products for beekeepers including the Goodland Bee Supply HE2MOT 2 Frame Motorized Honey Extractor. Other Goodland Bee Supply products that have served beekeepers very well over the years include: beehive kits, protective wear, and beekeeping tools. The Goodland Bee Supply HE2MOT Motorized Honey Extractor shows excellent craftsmanship and practical design. Using the extractor is quite the pleasurable activity. It is a tangential rotary extractor that utilizes centrifugal force to get honey from the beehive frames. The extractor is made of a drum with the electric motor at the top. It stands on three sturdy legs and features a honey gate to empty the drum once you have extracted some amount of honey. This motorized honey extractor is largely made of stainless steel material. This motorized honey extractor takes 2 beehive frames at a time. These may be shallow, medium or deep frames. Indeed, the frame basket provided in the extractor is large enough for the deep beehive frames and holds the smaller sized frames well enough. This extractor works with frames from Langstroth beehives, but may also be used with other types of beehives to some extent. Beekeepers with Layens hives and some top bar hives may find the Goodland Bee Supply HE2MOT Motorized Honey Extractor useful during honey harvests. This honey extractor has more than enough space for honey. 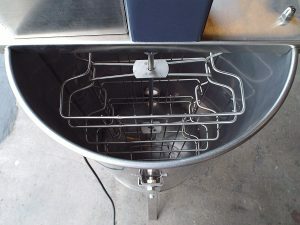 The drum of the extractor has a cross-section of 17 inches in diameter and a height of 34 inches. This translates to a capacity of more than 8 gallons. The extractor weighs 37 pounds while empty. The honey extractor uses 16-gauge stainless steel that is food grade. It does not impart impurities, odors or flavors to honey. This honey extractor is not tiring to work with. Beekeepers with access to electricity enjoy the full benefits of the extractor without getting too tired. Sealed bearings and gears made of steel make the extractor very durable and safe to work with in the food industry. A clear top made of Plexiglas allows you to see the progress of honey extraction from your hive frames without exposing the beekeeper to any hazard. 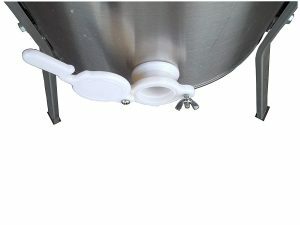 A sealable honey gate allows for easy emptying of the extractor drum. The honey gate seals up well, allowing no room for leaks that waste honey and dirty up your working area. The honey gate of this electric honey extractor may lead to some honey being left in the extractor drum. Beekeepers using the extractor can get around this weakness by simply tilting the extractor and holding it in that position for a few minutes. All the honey will drain out. Some small bits and parts of the extractor may get lost during cleaning. Beekeepers should be extra careful about where they place each detachable item of the extractor. Best practice requires that you do not necessarily go for dissembling the extractor all the time during cleaning. Expensive, especially considering that it can only hold two frames at a time. The GoodLand Bee Supply HE2MOT 2 Frame Motorized Honey Extractor stands on three sturdy legs. They can hold the weight of the drum even when it has a fair amount of honey inside it. The legs lift the extractor well off the ground. They allow a fairly sized bucket or other honey receptacle of your choice to go under the extractor comfortably. This makes it easy to drain honey from the extractor into your preferred container. Power is supplied to the honey extractor using a durable power cord. The length of cord supplied allows you to easily plug into power outlets without having to use extensions. This honey extractor runs on 110 V of electricity. Your electric source should be AC powered. The motor installed on the GoodLand Bee Supply HE2MOT 2 Frame Motorized Honey Extractor is a variable speed motor that allows beekeepers using the extractor to use just the right speed of rotation for their beehive frames. Varying the speed is very important for both electric and hand-cranked honey extractors. Beekeepers should begin extraction of each frame at a slow speed and then move up to the higher speed available. Running the motor of any honey extractor at a very high speed with a fully loaded frame may lead to blowouts. It is best to run the extractor motor at slow speed and extract honey in the 50-50-50-50 honey extraction method. This allows the beekeeper to gradually reduce the weight of the honey frames on both sides. It prevents blowouts that damage your frames and give bees more work building honeycomb. Blowouts occur when you run a honey extractor at higher speeds. The first two 50% extractions are done at slow speeds since the frames are heavy with honey. The second 50s can be done at higher speeds because the weight of the honey frame is already greatly reduced. Once in a while, equipment may develop problems and require repairs. This motorized honey extractor is no exception. It may break at some point, or you may lose some of the detachable parts. If this happens, Goodland Bee Supply has availed replacement parts. Additionally, depending on the seller from whom you bought the honey extractor, you may also get servicing either at your location or by returning broken parts to the seller. The Goodland Bee Supply HE2MOT 2 Frame Motorized Honey Extractor is built in a simple and very practical design that is efficient for beekeepers. During honey harvest time, the extractor clearly shows its worth, and it is very easy to clean too. Though it is more expensive that similar 2 frame electric extractors, it still provides great value for money. 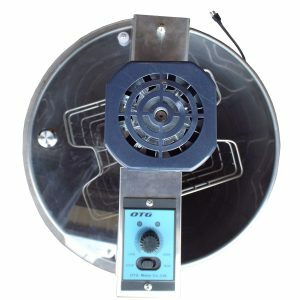 Beekeepers may purchase this honey extractor from online retailers or other beekeeping supplies stores. They may also get the extractor directly from Goodland Bee Supply. Have you ever used the Goodland Bee Supply HE2MOT 2 Frame Motorized Honey Extractor? Leave a comment below and let us know what your experience was like.